When this news came across my computer I knew I needed to share it with you. 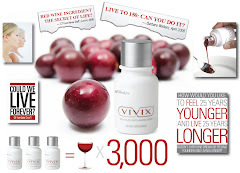 As you might know Shaklee manufactures Vivix an anti-aging resveratrol tonic. Looks like there may be more researched and documented benefits coming down the pike. Resveratrol, a molecule found in red grapes, has been shown to improve diabetes when delivered orally to rodents. Until now, however, little has been known about how these beneficial changes are mediated in the body. A new study accepted for publication in Endocrinology, a journal of The Endocrine Society, shows that the brain plays a key role in mediating resveratrol's anti-diabetic actions, potentially paving the way for future orally-delivered diabetes medications that target the brain. Sirtuins are expressed virtually everywhere throughout the body and until now, little has been known about what tissues mediate resveratrol's beneficial effects. Knowing where in the body the beneficial effects of activated sirtuins are mediated could help in the development of more effective targeted diabetes medications. "We know that sirtuins are expressed in parts of the brain known to govern glucose metabolism, so we hypothesized that the brain could be mediating resveratrol's anti-diabetic actions," said Roberto Coppari, PhD, of the University of Texas Southwestern Medical Center and co-author of the study. "To test the hypothesis, we assessed the metabolic consequences of delivering resveratrol directly into the brain of diabetic mice. We found that resveratrol did activate sirtuins in the brain of these mice which resulted in improving their high levels of blood sugar and insulin." "These findings may lead to new strategies in the fight against type 2 diabetes," said Coppari. "By knowing that the brain mediates resveratrol's anti-diabetic actions, industry can now focus on developing sirtuin activators that directly target the brain. When orally-delivered, these drugs will likely improve diabetes without affecting the other organs in which activation of sirtuins may not always be beneficial." The article, "Central administration of resveratrol improves diet-induced diabetes," will appear in the December 2009 issue of Endocrinology.